We are pleased to inform you of the result of Euro Millions, which was Held on the 6th , November 2006.Your e-mail address attached to ticket number: 22-18-34-45-67 (00-32).With Prize Number (match 5): 444000009 drew a prize of 1,000,000.00 (One Million Euros). This lucky draw came first in the 2nd Category of the Sweepstake. This sweepstake was conducted under the watchful eyes of 8,000 spectators. Your e-mail address attached to e-ticket number 22-18-34-45-67 (00-32) was selected and; it came out first by an e-ballot draw from over 250,000 e-mail addresses (personal and corporate e-mail addresses). This program is sponsored by CFI to compensate faithful internet suffers around the globe. Congratulations for becoming one of the few lucky winners.With your permission, your e-mail will also be included in the next Sweepstake of 5 Million Euros.You must claim our prize: �1,000,000.00 Euros not later than 7-days from the moment you receive this e-mail.In order to avoid unnecessary delays with your claim be advice to contact your claims agent through information below as soon as possible. Previous: Congratulation Your Em ... on!! !Fresh ScamsNext: CONGRATULATION YOUR E- ... !!!!! This Email with the Subject "CONGRATULATIONS!!!" was received in one of Scamdex's honeypot email accounts on Sun, 12 Nov 2006 07:51:38 -0800 and has been classified as a Generic Scam Email. 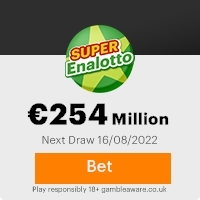 The sender shows as "EURO MILLIONS LOTTERY." <wineuro_m_14@hotmail.com>, although that address was probably spoofed. We recommend that you do not attempt to contact any persons or organizations referenced in this email, as you may expose yourself to scammers and, at the very least, you will be added to their email address lists for spam purposes.